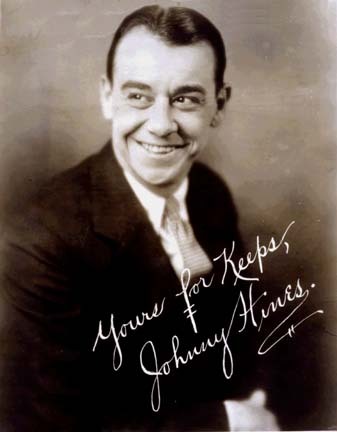 Johnny Hines was born Jun2 25, 1895, in Golden, CO. He attended the City College of New York in the 1910s. He made his film debut in 1914 in a Robert Warwick feature, "The Man of the Hour." His first starring role was in a 1915 film entitled "The Cub" which was directed by Maurice Tourneur. He worked steadily in supporting roles making as many as seven films in one year during the late 'teens. "Burn 'Em Up Barnes" (1921) featured Hines in the type of film he would come to be identified with in the 1920's - breezy, light comedies that, just as Harold Lloyd, had him overcoming what seem to be insurmountable odds and winning the girl in the end. Some of these films that are available for viewing today include "Burn 'Em Up Barnes" (1921), "Luck" (1923), "Conductor 1492 (1924), "The Speed Spook" (1924), "The Crackerjack" (1925), "The Early Bird" (1925), and "The Live Wire" (1925). Between 1914 and 1928, he made over 50 films. With the advent of sound, Hines was relegated to a few minor extra roles. He appeared in only seven films during the sound era, the last in 1946 in "Magnificent Doll." His brother was film director Charles Hines, and another brother, Samuel, was a bit part actor during the early sound years. Hines was married to Irma Warner. He died in 1970 in Los Angeles.